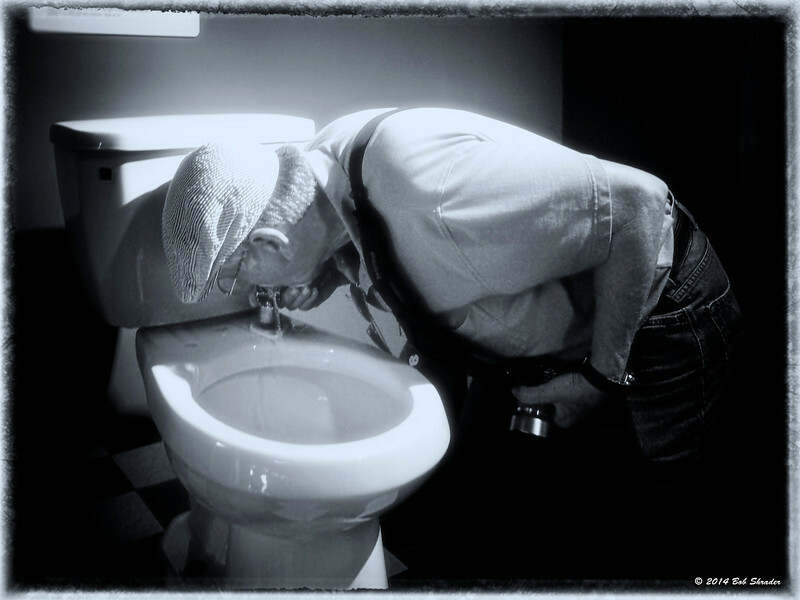 A drinking fountain installed on a toilet. An exhibit at the Exploritorium, a museum of science, art and human perception, Pier 15 on the Embarcadero, San Francisco, Califonia. The museum has been described as a scientific funhouse. It's certainly fun for all ages. Shot with a Sony DSC-W650. Converted to Black and White for an old film look. Post processing in Capture One Pro 7, Google Nik Collection Silver Efex Pro 2 and PhotoLine 18. Film noir look applied with Silver Efex Pro 2 after High Contrast B&W preset in Lightroom 5.5. Raw processing in DxO Optics Pro. Post processing in onOne Perfect Photo Suite 8 via ACDSee Pro 7, PhotoLine 18 and Google Nik Collection Silver Efex Pro 2 (Fuji Neopan Pro 1600 film effect). 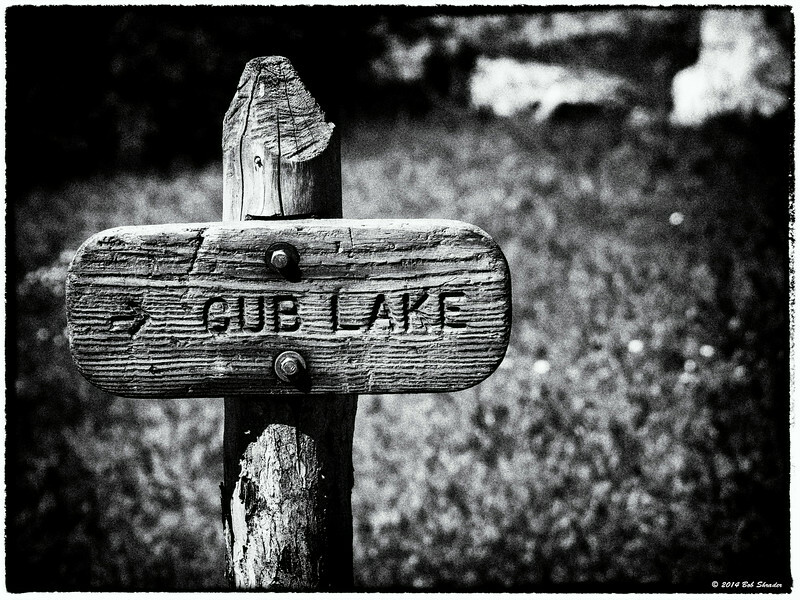 Hiking trail sign pointing to Cub Lake. Rocky Mountian Naitonal Park, Colorado. Raw conversion in Capture One Pro 7. Post processing in Google Nik Collection Silver Efex Pro 2 and ACDSee Pro 7. Flower in water. Raw conversion in Capture One Pro 7. 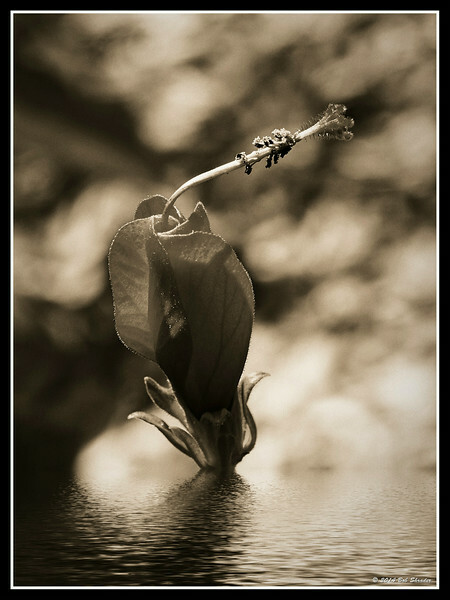 Post processing in PhotoLine 18, Flaming Pear Flood and DxO FilmPack 4 (Ilford Delta 100 film with Sepia Terra). This rocky and unproductive land has been sewn with grain in hopes of making grazing and hay for cattle. The old house ruins in the background signify there were much better times here a couple of generations ago. Raw conversion in Capture One Pro 7. Post processing in PhotoLine 18 and Google Nik Collection Dfine 2. 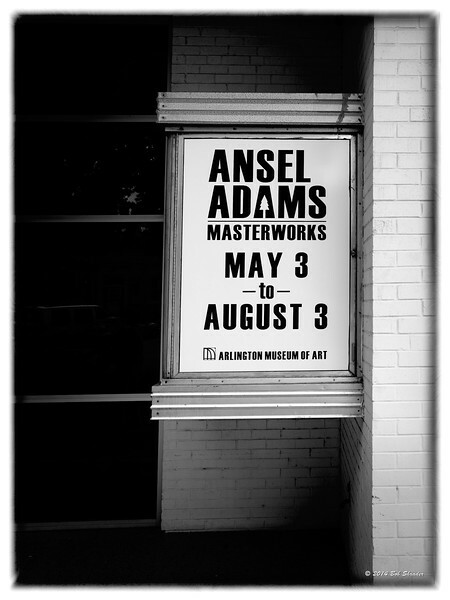 A sign for the Ansel Adams Masterworks exhibit at the Arlington Museum of Art, Arlington, Texas. Raw conversion in DxO Optics Pro 9.5. Post processing in PhotoLine 18 and Topaz B&W Effects 2. 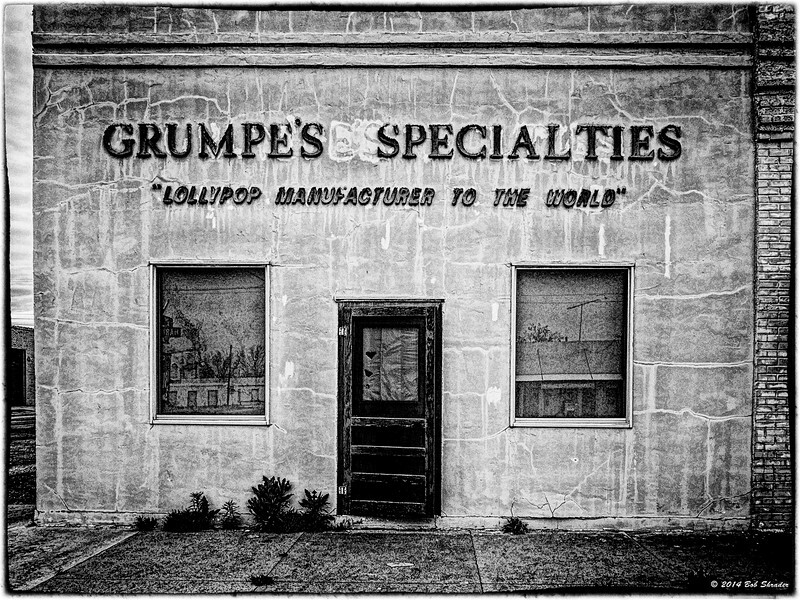 Grumpe's Specialities building in Baird, Texas, a company billing itself as the "Lollypop Manufacturer to the World." Raw conversion in Capture One Pro 7. 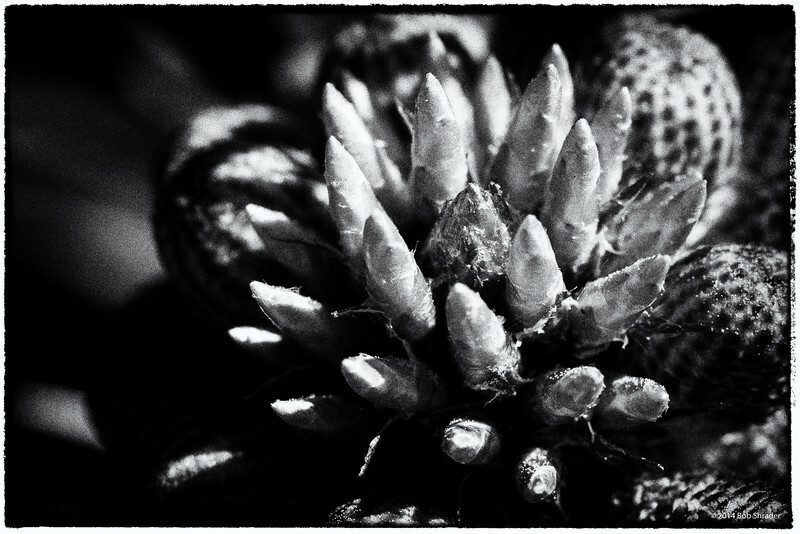 Post processing in PhotoLine 18, Topaz Detail 3, Topaz Clarity and Silver Efex Pro 2. 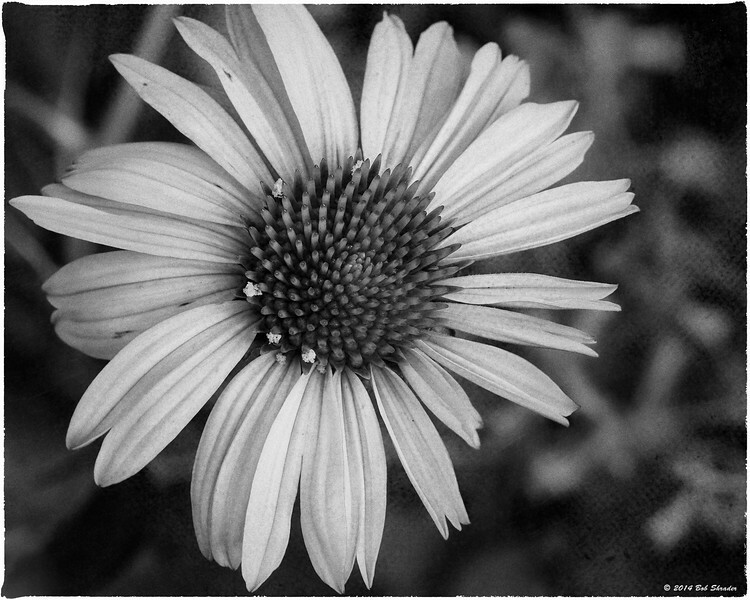 Blooming Purple Coneflower with with look of old Kodak Tri-X 400 film grain and additional texture applied.. Raw conversion and post processing in Capture One Pro 8. Additional post processing in DxO Filmpack 4, PhotoLine 18.51 and Topaz Adjust 5. 2 of 3 renderings of Winecup at the Ladybird Johnson Wildflower Center, Austin, Texas. Raw conversion in Capture One Pro 8. Post processing in PhotoLine 18, onOne Perfect Photo Suite 8.5 and Topaz B&W Effects 2. Winecup at the Ladybird Johnson Wildflower Center, Austin, Texas. Raw conversion in Capture One Pro 8. Post processing in PhotoLine 18, onOne Perfect Photo Suite 8.5 and Topaz B&W Effects 2. A two-story home, recently remodeled, dating to the early years of the 20th century. Raw conversion and HDR processing in Photomatix Pro 5. 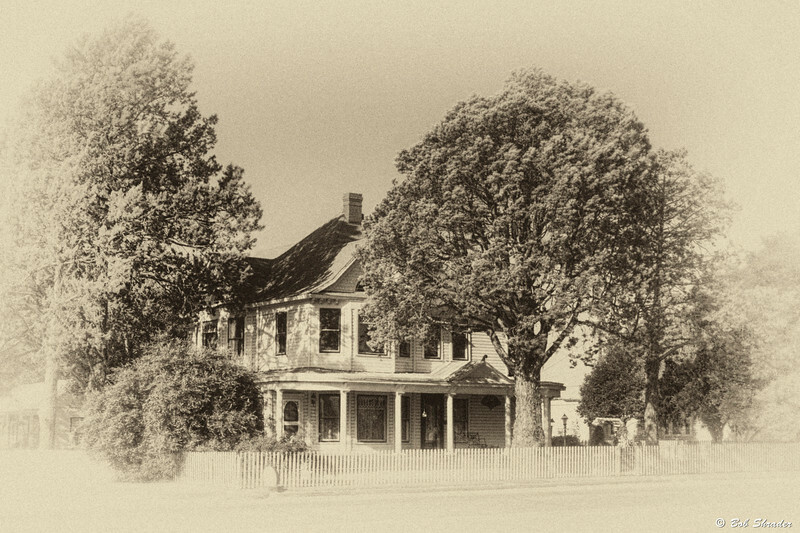 Additional post processing in PhotoLine 18, Perfect Photo Suite 8.5 and Google Nik Silver Efex Pro 2. A trumpet creeper (Campsis radicans) in bloom. Raw conversion in DxO Optics Pro 9.5. Post processing in PhotoLine 18 and Google Nik Collection Silver Efex Pro 2. 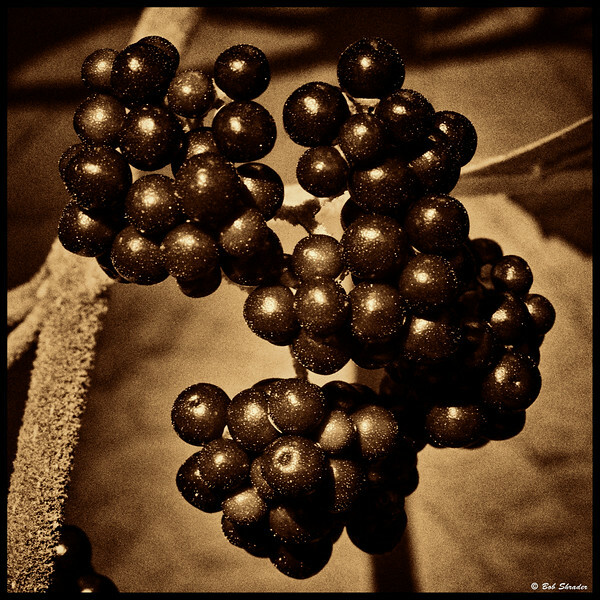 American Beautyberry in B&W. Raw conversion in Capture One Pro 8 with B&W film grain applied. Post processing in Google Nik Collection Viveza 2, Topaz B&W Effects (Raw Umber Dynamic preset) and PhotoLine 18. Flowers growing in the Scranton Cemetery, Scranton, Eastland County, Texas. Raw conversion in Photo Ninja 1.2.4c. Post processing in PhotoLine 18, Google Nik Collection Viveza 2 and Topaz B&W Effects 2. The Ogg House located in the King William Historical District of San Antonio. This home was one of the first stone residences in San Antonio with construction of the basement and first floor as early as 1857. Shot with an Olympus E-420 and M.Zuiko 25mm f/2.8. Raw conversion in Capture One Pro 8 via Lightroom 5.6. 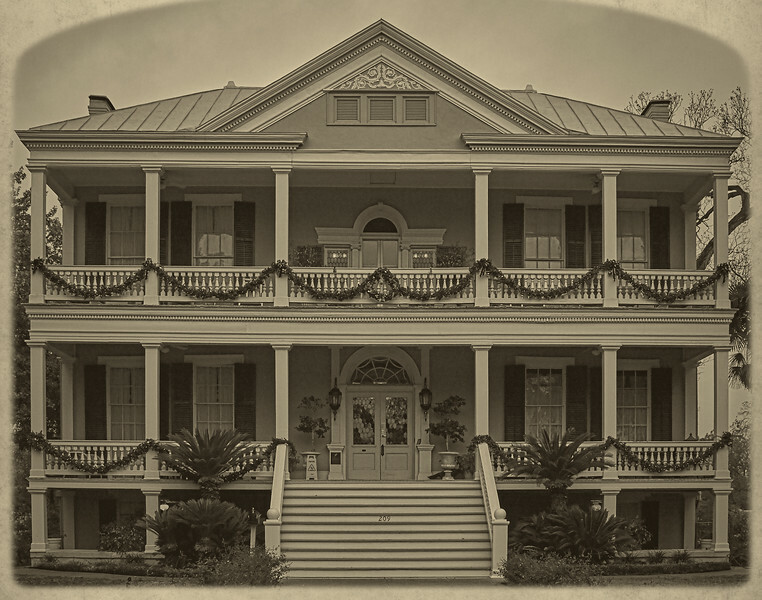 Post processing in Photoshop CC 2014 and onOne Perfect Photo Suite (B&W 19th century film look applied). 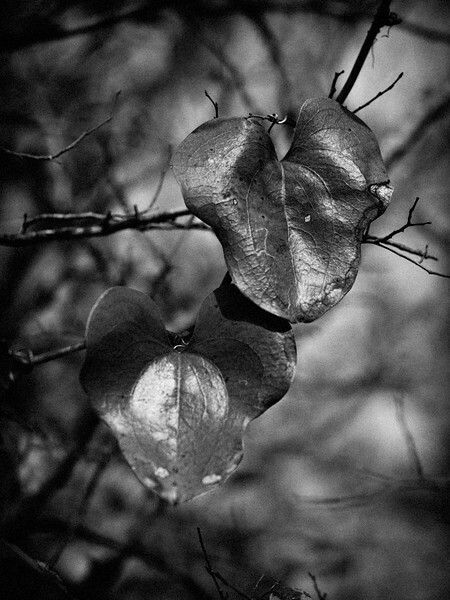 In black and white, natural kicker light for a Drummond's Turk's Cap (Malvaviscus arboreus var. drummondii) a wildflower native to Texas. Shot with an Olympus OM-D E-M1 and M.Zuiko 12-40mm f/2.8 PRO. Raw conversion in DxO Optics 9.5 via Lightroom 5.6. 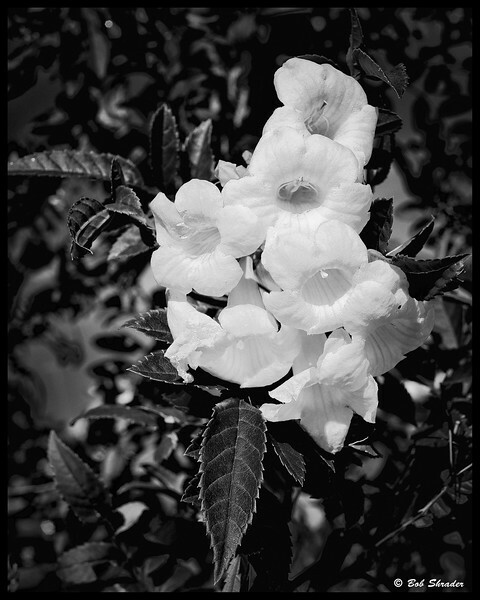 Post processing in Photoshop CC 2014 and DxO FilmPack 4 (Black & White Film, Kodak High Speed Infrared preset). 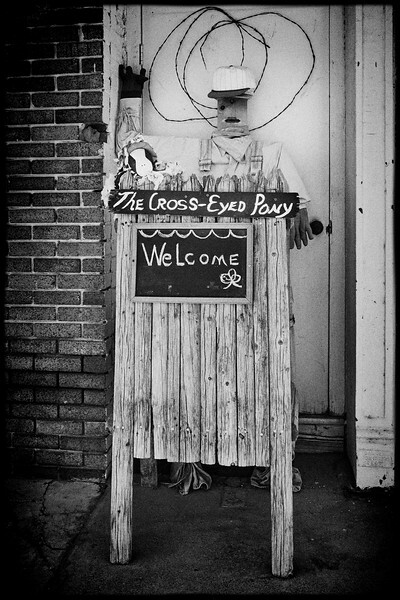 Artistic rendering of a folk art sign made with wood, wire, paint and other matierials outside a store on the main street of Rising Star, Eastland County, Texas. Shot with an Olympus OM-D E-M1 and M.Zuiko 12-40mm f/2.8 PRO. 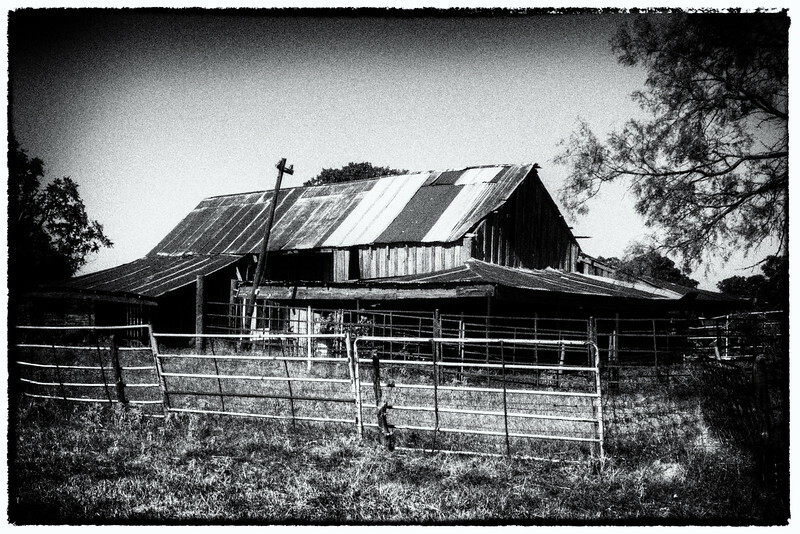 Raw conversion and black and white film effects applied in Capture One Pro 8 via Lightroom 5.6. Additional post processing in Photoshop CC 2014 and Topaz Adjust 5. A northeastern writer once described a city in this region of Texas as having more churches than trees. 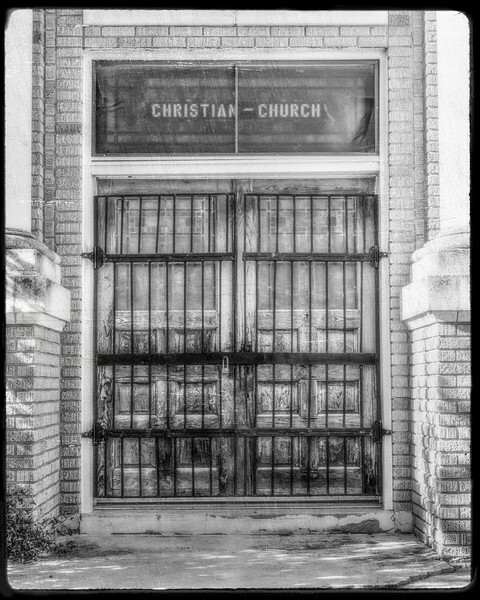 So it's a bit unusual to see a church in Texas with padlocked doors. This old Christian Church was built in 1927 during a boomtime in Moran, Shackelford County, Texas. It's now closed because of decline in membership accompanying a decline in the tiny town's population. Shot with an Olympus OM-D E-M1 and M.Zuiko 12-40mm f/2.8 PRO. Raw conversion in Lightroom 5.6. Post processing in Photomatix Pro 5, Topaz Detail 3 and DxO FilmPack 4 for old black and white film look. 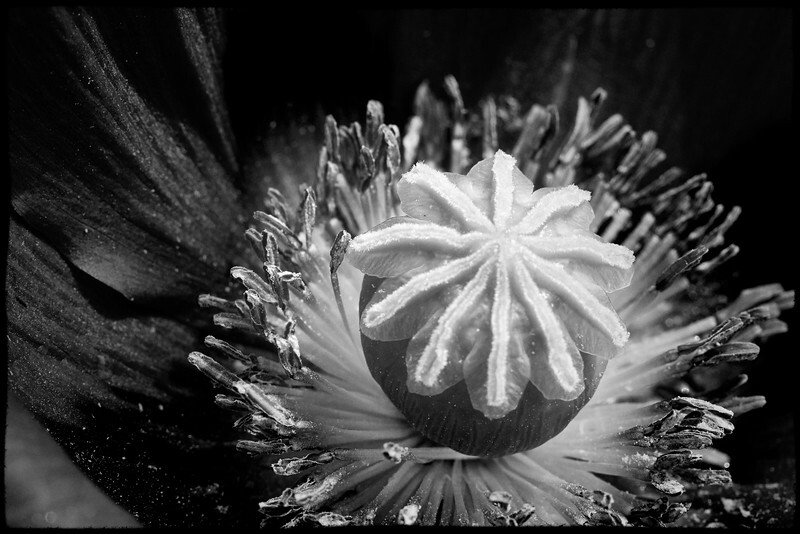 The center of a red poppy. Short with an Olympus OM-D E-M5 and M.Zuiko 60mm f/2.8 macro. Raw conversion in Phase One Capture One Pro 8 via Lightroom 5.6.. Post processing in Lightroom, Photoshop CC 2014 and Topaz B&W Effects 2. The leaves of a briar vine on an urban trail in Austin, Texas. Short with an Olympus OM-D E-M1 and M.Zuiko 60mm f/2.8 macro. Raw conversion in Lightroom 5.6, Post processing in Photoshop CC 2014, Topaz Detail and Alien Skin Exposure 6 (B&W conversion for a film look of Kodak Tri-X pushed 2 stops). 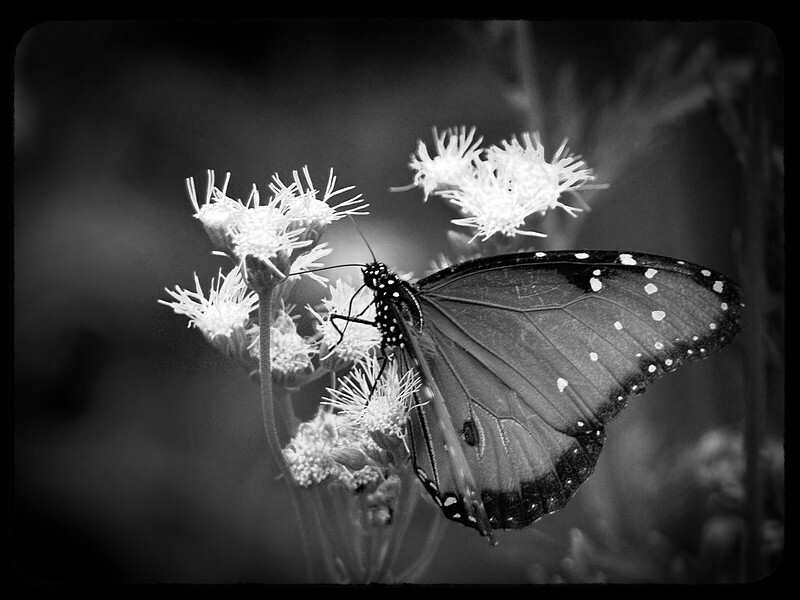 Butterfly in Black and White. Ladybird Johnson Wildflower Center, Austin, Texas. Shot with an Olympus 4/3 E-620 and M.Zuiko 40-150mm. Raw conversion in DxO Optics Pro 10 via Lightroom 5.6. Post processing in Photoshop CC 2014, Topaz Clarity, Topaz Detail 3 and Alien Skin Exposure 6. 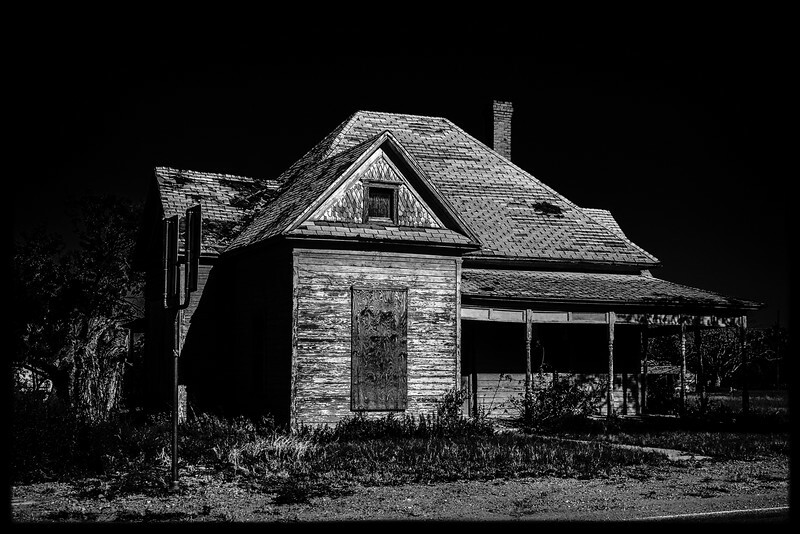 A long unoccupied house in the tiny town of Moran, Shackelford County, Texas. Shot with an Olympus OM-D E-M1 and 12-40mm f/2.8 PRO. Raw conversion in Phase One Capture One Pro 8 via Lightroom 5.6. Post processing in Photoshop CC 2014, Topaz Clarity, Topaz Detail 3 and Topaz B&W Effects 2. 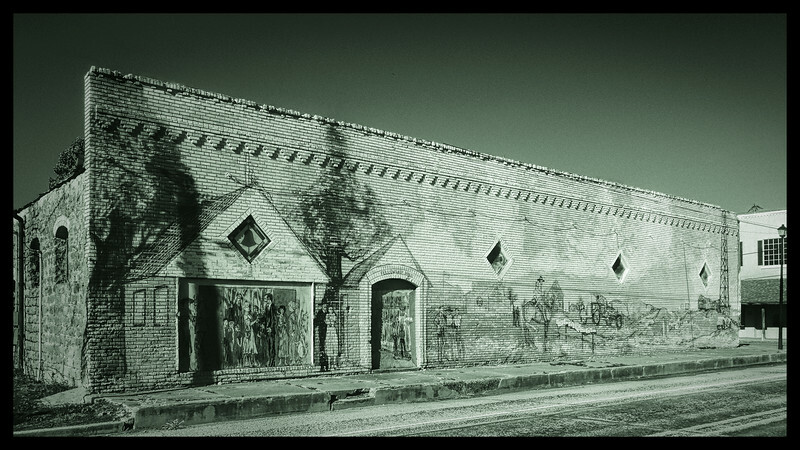 Stains and time have prompted the deterioration of a mural covering the entire street-side of this long building in the tiny town of Moran, Shackelford County, Texas. Shot with an Olympus OM-D E-M1 and M.Zuiko 12-40mm f/2.8 PRO. Raw conversion in Phase One Capture One Pro 8 via Lightroom 5.6. Post processing in Photoshop CC 2014, Topaz Clarity, Topaz Detail 3 and DxO FilmPack 4 (Ilford Delta 400 film look and Ferric Sulfate Toning). A few autumn American Pokeweed berries not yet consumed by birds. Shot with an Olympus OM-D E-M1 and M.Zuiko 60mm f/2.8 Macro. Raw conversion in Lightroom 5.7 with Huelight camera profile. Post processing in Photoshop CC 2014, Topaz Adjust 5, Topaz Clarity, Topaz B&W Effects 2 (Selenium I). 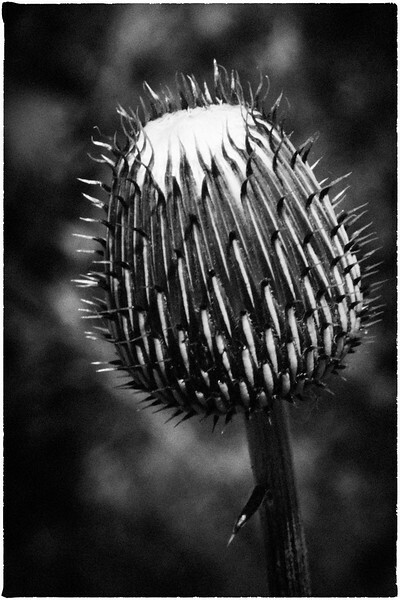 Black and white film rendition of the bud of a Texas Thistle (Cirsium texanum). Shot with an Olympus OM-D E-M5 and M.Zuiko 60mm f/2.8 Macro. Raw conversion in Phase One Capture One Pro 8. Post processing in Photoshop CC 2014, Alien Skin Exposure 6 (vintage Polapan, Polaroid monochrome slide film effect) and Topaz B&W Effects 2. Old black and white film look. 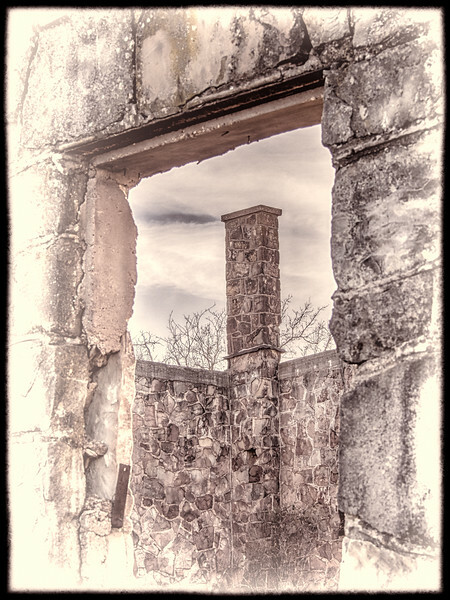 Viewpoint through a standing wall of the ruins of the old depression-era rock gymnamium on what was once the Scranton Schools property in Scranton, Eastland County, Texas. Shot with an Olympus OM-D E-M1 and M.Zuiko 40-150mm f/4.0-5.6 R. Raw conversion in Phase One Capture One Pro 8 via Lightroom 5.7. Post processing in Google Nik HDR Efex Pro 2, Topaz Clarity, Topaz Detail 3 and Topaz B&W Effects 2. 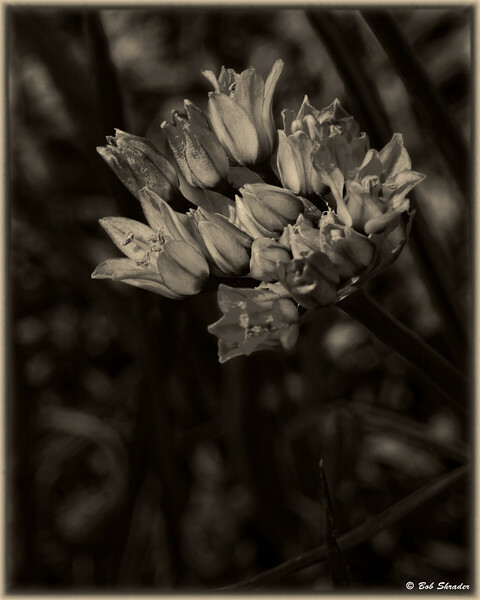 Black and white rendering, one of two version of this image of a Texas wildflower. 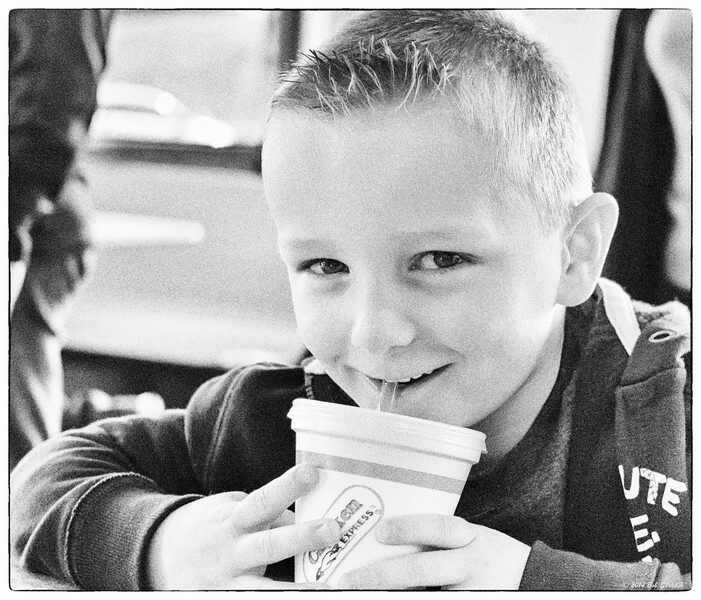 I love black and white and the grainy film look that can be achieved with the plugin used here. 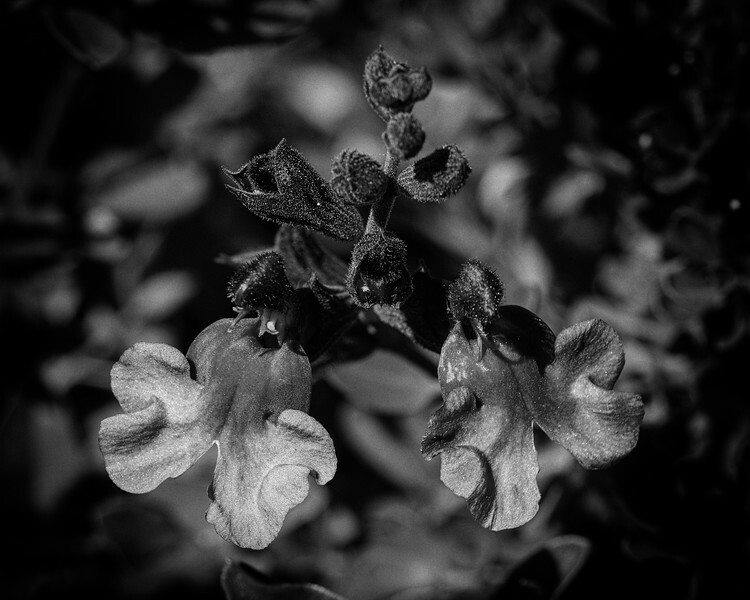 Blossoms of Autumn Sage (Salvia greggii) AKA Cherry sage, Gregg salvia. Ladybird Johnson Wildflower Center, Austin, Texas. Shot with an Olympus OM-D E-M5 and M.Zuiko 60mm f/2.8 Macro. Raw conversion in Phase One Capture One Pro 8 via Lightroom 5.7. 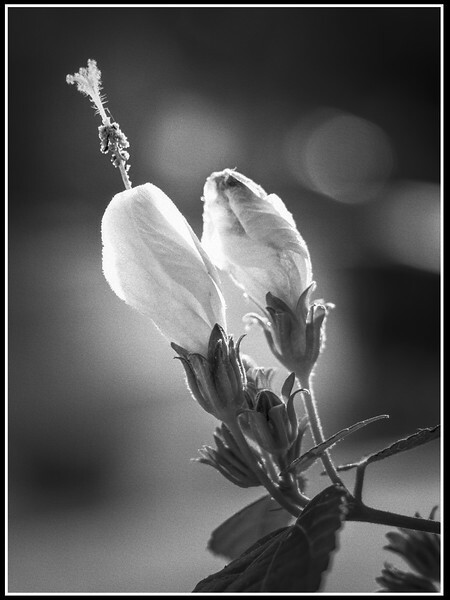 Post processing in Photoshop CC 2014, Topaz Clarity, Topaz Detail 3, Exposure 7 and DxO FilmPack 5 (Tri-X 400 film). Black and white rendering of autumn scene on a suburban trail in Southwest Austin, Texas. Shot with an Olympus OM-D E-M1 and M.Zuiko 12-40mm f/2.8 PRO. Raw processing in Picture Code Photo Ninja 1.2.4 via Lightroom 5.7. 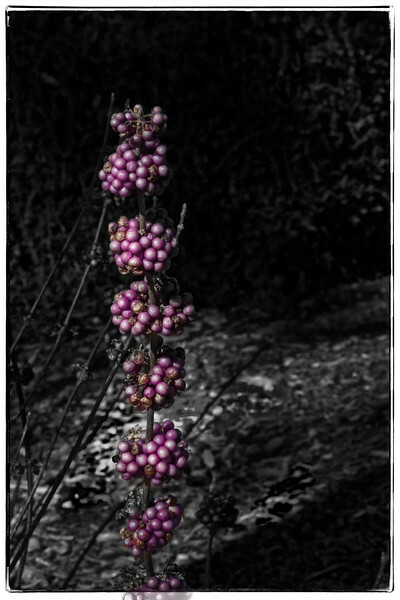 Post processing in Photoshop CC 2014, Google Nik Color Efex Pro 4 and Topaz B&W Effects (Aubergine Dynamic look). 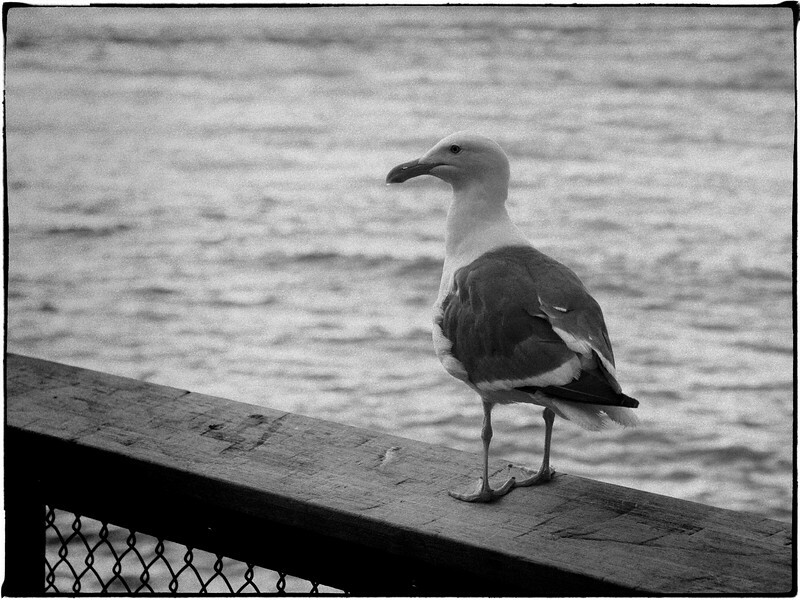 A gull on a pier railing at San Francisco Bay. Shot with an Olympus OM-D E-M5 and M.Zuiko 45mm f/1.8. Raw conversion in Lightroom 5.7. 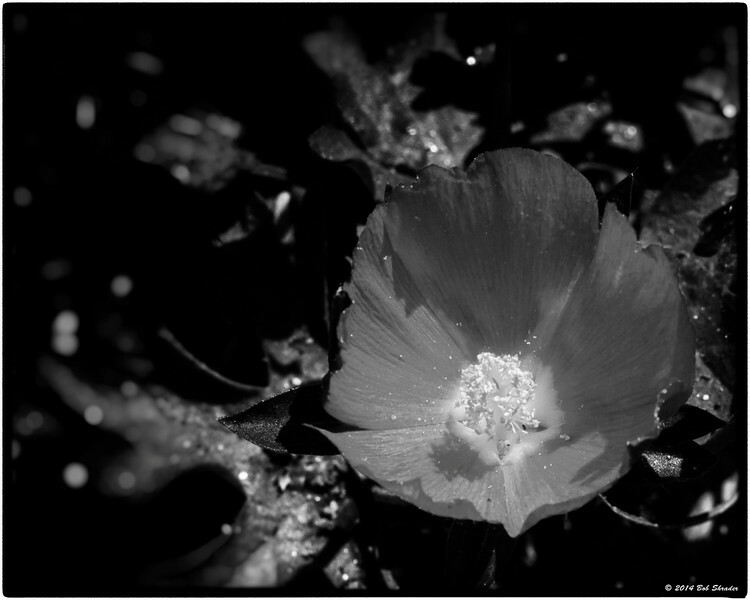 Post processing in Photoshop CC 2014, DxO FilmPack 5 (Ilford Delta 3200 negative file) and Topaz B&W Effects 2. 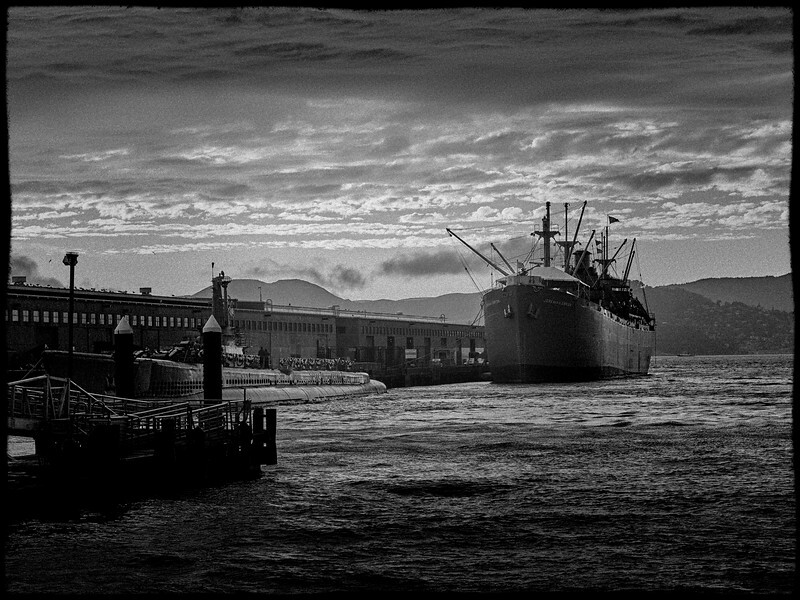 A ship at the pier in San Francisco Bay. Shot with an Olympus OM-D E-M5 and M.Zuiko 45mm f/1.8. Raw conversion in Capture One Pro 8 via Lightroom 5.7. 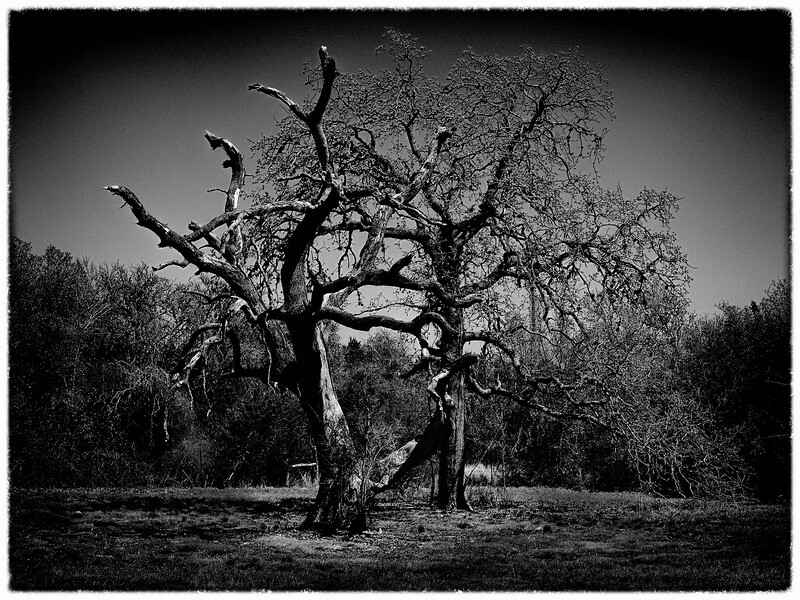 Post processing in Photoshop CC 2014, DxO FilmPack 5 (Ilford Delta 3200 B&W negative film look) and Topaz Labs B&W Effects 2. 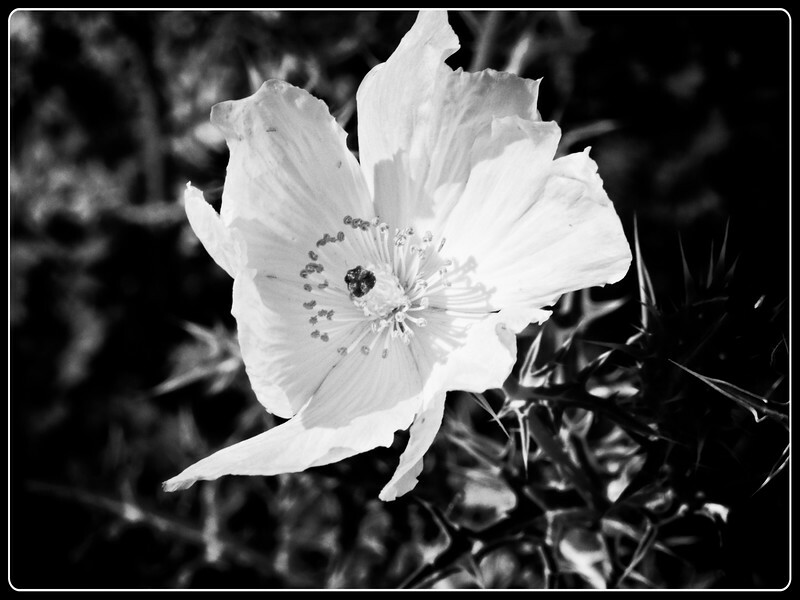 Black and white rendering of Mexican prickly poppy (Argemone mexicana), habitat: in waste places, fields and along roadsides. Ladybird Johnson Wildflower Center, Austin, Texas. Shot with an Olympus OM-D E-M5 and M.Zuiko 60mm f/2.8 Macro. Raw converion in DxO Optics Pro 10 via Lightroom 5.7. Post processing in Photoshop CC 2014, Google Nik Viveza 2, onOne Perfect Effects Suite 9 and Perfect B&W Suite 9. Application of grainy black and white film look. Two live oak trees in the last stages of life, likely victims of oak wilt, which has devastated a significant portion of the oak tree population in south and central Texas. Lady Bird Johnson Wildflower Center, Austin, Texas. Shot with an Olympus OM-D E-M5 and M.Zuiko 40-150mm f/4.0-5.6 R. Raw conversion in Phase One Capture One Pro 8 via Lightroom 5.7. Post processing in Photoshop CC 2014, Topaz Clarity, Topaz Detail 3 and Topaz B&W Effects 2. Processed for final vintage black film look. 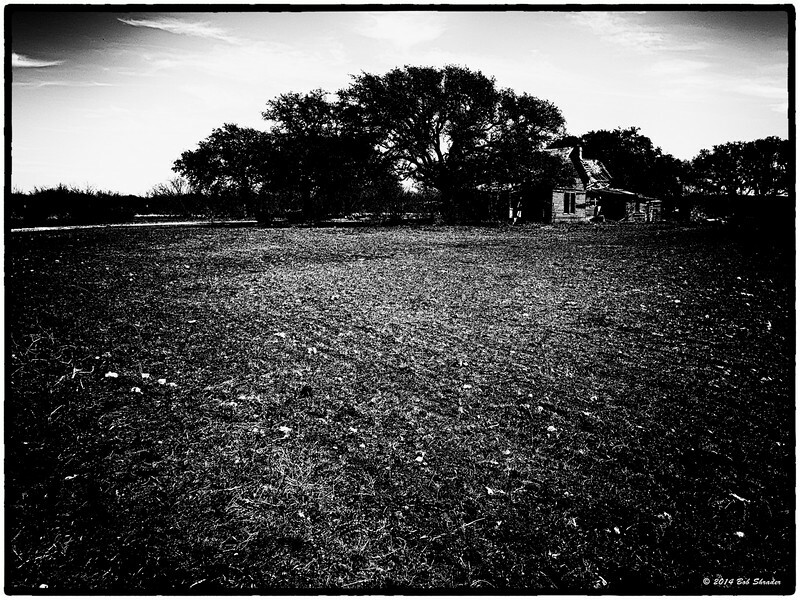 An old barn on Ledbetter's place west of Scranton on FM 1864 in Callahan County, Texas. Shot with an Olympus OM-D E-M5 and Lumix G 20mm f.1.7. Raw HDR processing in Photomatix Pro 5 via Lightroom 5.7. Post processing in Photoshop CC 2014 and Google Nik Silver Efex Pro 2. 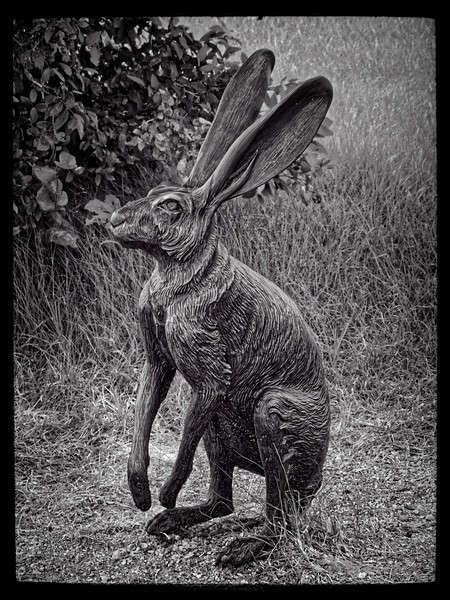 A black-and-white film look applied to a statue of a Black-Tailed Jackrabbit (Lepus californicus), here in Texas, an animal found mostly in western and northern parts of the state. This sculpture in the children's garden area of the Ladybird Johnson Wildflower Center in Austin, Texas. It's likely most of the visitors to the center -- children and adults -- have ever seen this animal. Jackrabbit habitat is in rural areas and localized populations seem to be boom or bust due to various factors including disease. Shot with an Olympus OM-D E-M1 and M.Zuiko 60mm f/2.8 Macro. Raw conversion in DxO Optics Pro 10 via Lightroom 5.7. Post processing in Photoshop CC 2014 and onOne Perfect Effects 9 Suite. Black and White film look. A recent rain has resulted in isolated puddles of water in the mostly-dry limestone bed of Williamson Creek in southwest Austin, Texas. Shot with an Olympus m4/3 OM-D E-M5 and Zuiko 60mm f/2.8 Macro. Raw conversion in DxO Optics Pro 10 via Lightroomn 5.7. Post processing in onOne Perfect Photo Suite 9. 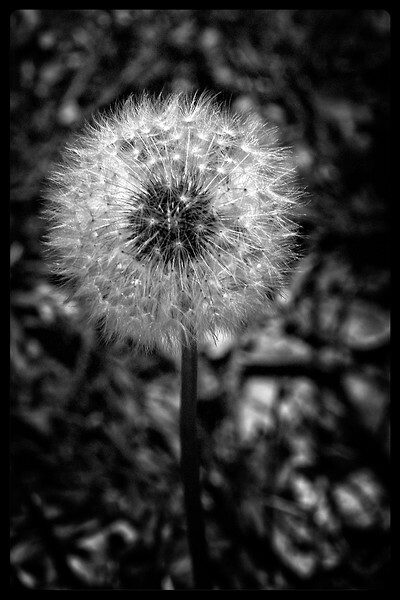 This dandelion has already bloomed and is now ready for the annual launch of nature's sails of seeds with the winds. 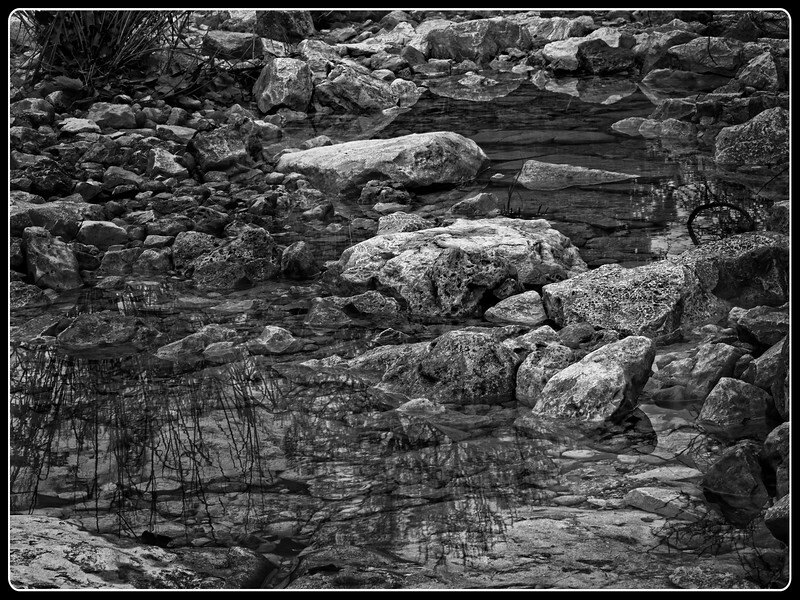 Shot along the hike and bike trail at the Shops at Arbor Trails, a shopping center complex in southwest Austin, Texas. Olympus E-620 and M.Zuiko 50mm f/:2.0 Macro. Raw conversion in DxO Optics Pro 10 via Lightroom 5.7. Post Processing in Photoshop CC 2014, onOne Perfect Effects 9 Suite and Alien Skin Exposure for B&W film look (Kodak Professional BW400CN preset). Just one of the many products residents of Central Texas are using for "Cedar Fever" relief this time of year. The male juniper cedar trees are still releasing that tiny microscopic pollen that creates misery in the sinus cavities. Shot with an Olympus E-M1 and Lumix G 20mm f.1.7. Raw conversion in Phase One Capture One Pro 8 via Lightroom 5.7. Post processing in Photoshop CC 2014, Google Nik Viveza 2, onOne Perfect Effects 9 Suite and Alien Skin Exposure 7 for B&W film effect (Kodak Professional BW400CN preset). 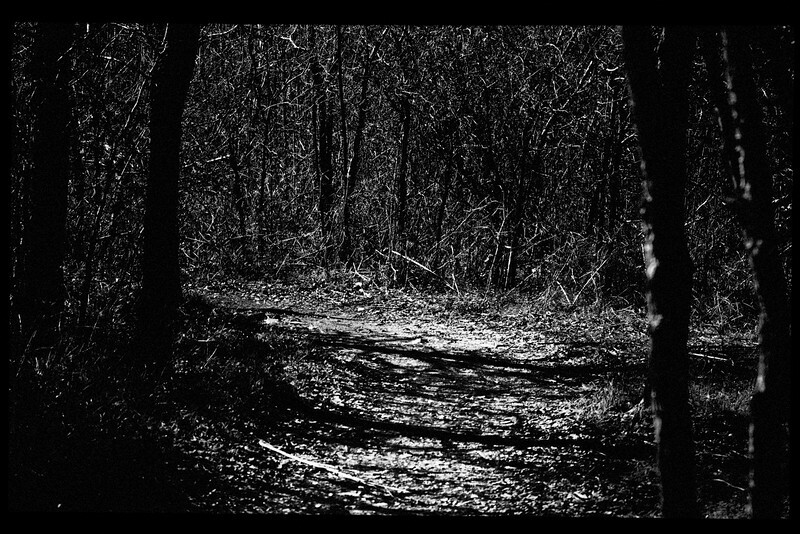 Black and white rendering of pathway in a suburban pocket park in Southwest Austin, Texas. Shot with an Olympus E-M1 and Olympus 70-300mm. Raw conversion in DxO Optics Pro 10 via Lightroom 5.7. Post processing in Photoshop CC 2014 and Alien Skin Exposure 7. 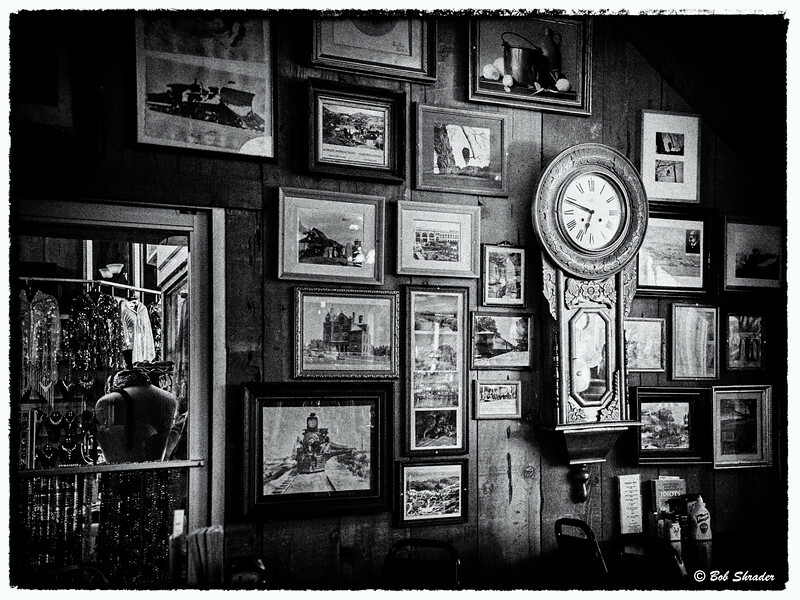 A Film Noir look applied to a digital image of a wall in a bar in historic Virginia City, Nevada. Shot with an Olympus E-M5 and Lumix G 20mm f/1.7. Raw conversion in Phase One Capture One Pro 8 via Lightroom 5.7. Post processing in Photoshop CC 2014, DxO ViewPoint 2, Topaz Adjust 5 and Google Nik Silver Efex Pro 2. 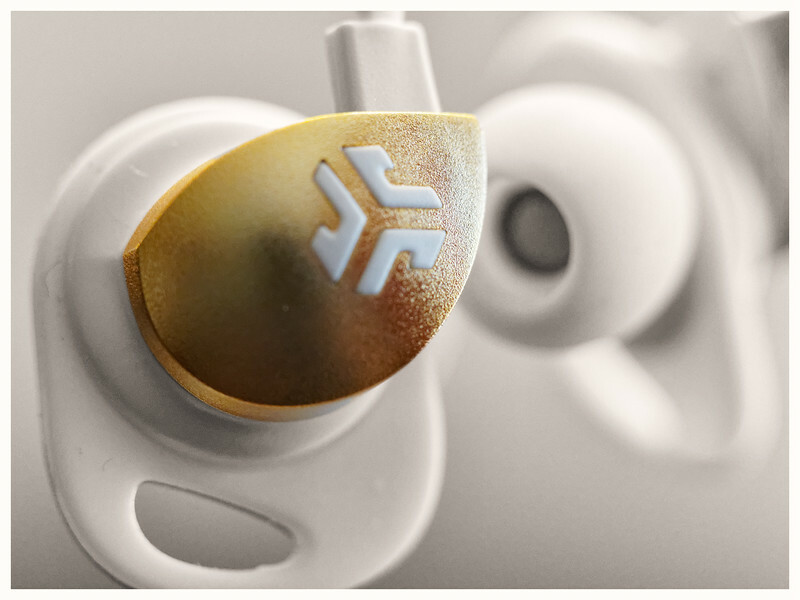 3rd version of rendering of still life closeup shot of earbuds. This one, Black & white with spot (gold) color. Olympus OM-1, M.Zuiko 60mm f/2.8 Macro and Vello 26mm (10mm+16mm) extension tubes. Raw conversion in DxO Optics Pro 10. Post processing in Photoshop CC 2014 and Topaz B&W Effects 2. 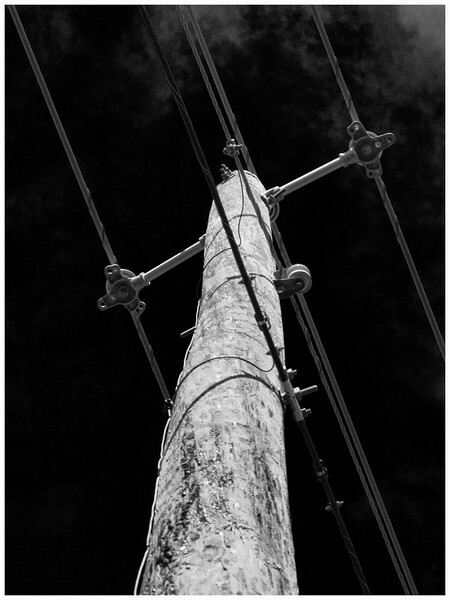 An infrared look at an electrical pole and lines in a small neighborhood pocket park in southwest Austin, Texas. These small parks and trails are usually placed in utility easement areas like this. Shot with an m4/3 Olympus E-M1 and M.Zuiko 70-300mm f/4-5.6 ED 4/3 lens. Raw conversion in Phase One Capture One Pro 8 via Lightroom 5.7. 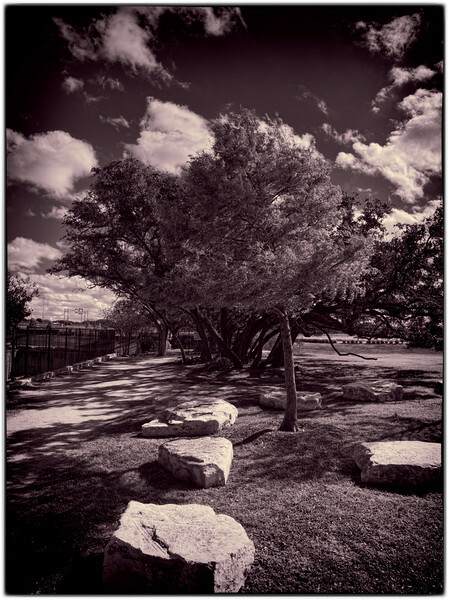 Post processing in Photoshop CC 2014, Topaz Adjust 5 and Topaz B&W Effects 2 (Infrared II film-look preset). 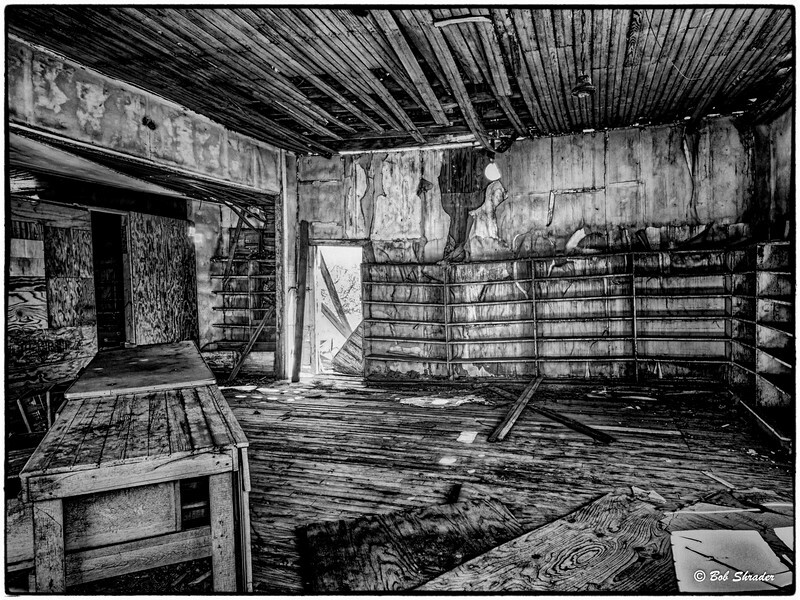 An old film and B&W grunge look applied to interior of an old gas station building, Cottonwood, Callahan County, Texas. Shot with an Olympus OM-D E-M1 and M.Zuiko 12mm f/2.0. Raw conversion in DxO Optics Pro 10 via Lightroom 5.7. Post processing in Photoshop CC 2014, Google Nik HDR Efex Pro 2 and Topaz B&W Effects 2. 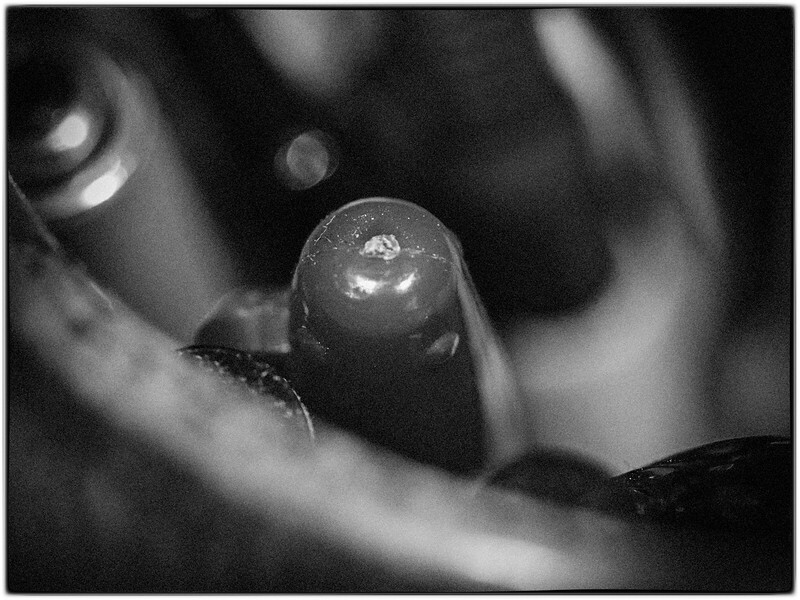 Black and white film effect applied to a shallow depth of field digital image of pens in ceremic holder. Shot with an Olympus E-M1 and M.Zuiko 60mm f/2.8 Macro. Raw conversion in Phase One Capture One Pro 8 via LIghtroom 5.7. Post processing in Photoshop CC 2014, Alien Skin Exposure 7 (Kodak T-Max P3200 preset) and Google Nik Color Efex Pro 4. Black and white film effect. 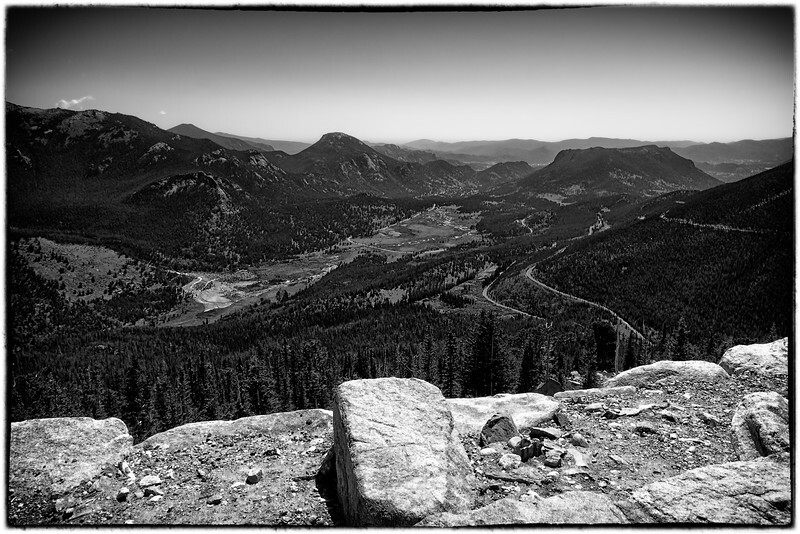 Rocky Mountain National Park, Colorado, looking down into the valley through which Fall River Road leads to the city of Estes Park. Shot with an Olympus E-M1 and M.Zuiko 12mm f/2.0. Raw conversion in Phase One Capture One 8 via Lightroom 5.7. Post processing in Photoshop CC 2014, on1 Perfect Effects 9.5 Suite, Topaz ReStyle and Google Nik Silver Efex Pro 2. 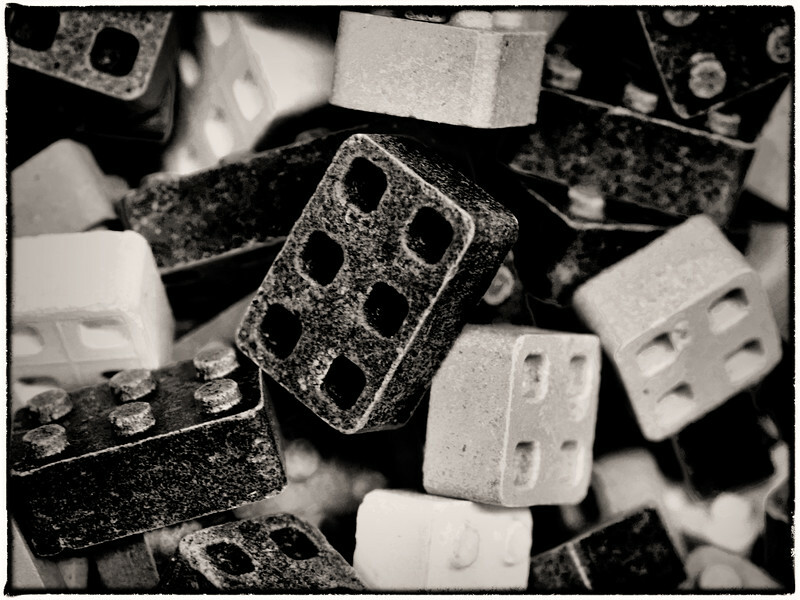 B&W version of the candy blocks. These may look like blocks your kids or grandkids might use to construct a toy house. But they're actually candy blocks, marketed as "Candy Blox" from the people who bring you Tootsie Rolls. Among rows of bulk confections at Central Market in south Austin, Texas. Shot with an Olympus E-M1 and M.Zuiko 60mm f/2.8 Macro. Raw conversion in DxO Optics Pro 10 via Lightroom 5.7. Post Processing in Photoshop CC 2014, Topaz Adjust 5, Topaz B&W Effects and Topaz Clarity. 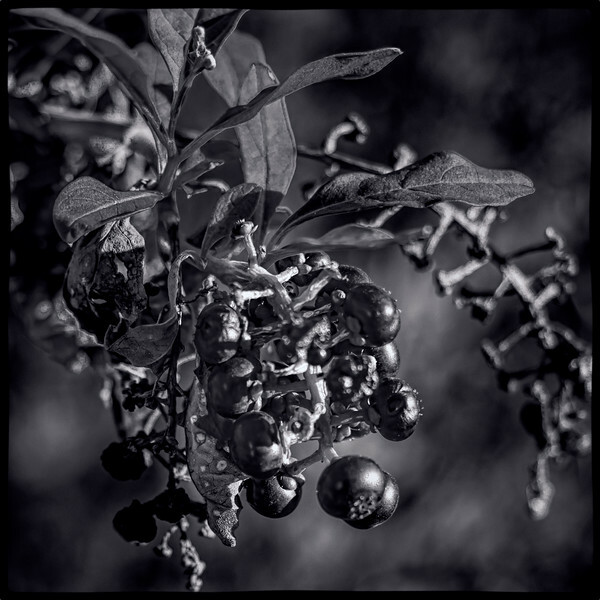 A small amount of color in this black and white film-style rendering of an autumn American Beautyberry (Callicarpa americana) on the hike and bike trail at the Shops at Arbor Trails in southwest Austin, Texas. Shot with an Olympus E-M1 and M.Zuiko 60mm f/2.8 Macro. Raw conversion in Lightroom 5.7. 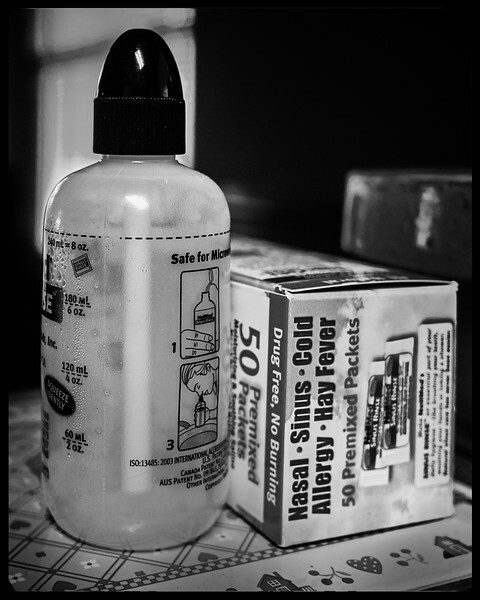 Post processing in on1 Perfect Photo Suite 9.5, using the B&W module (32-Kodak Panatomic X film grain). 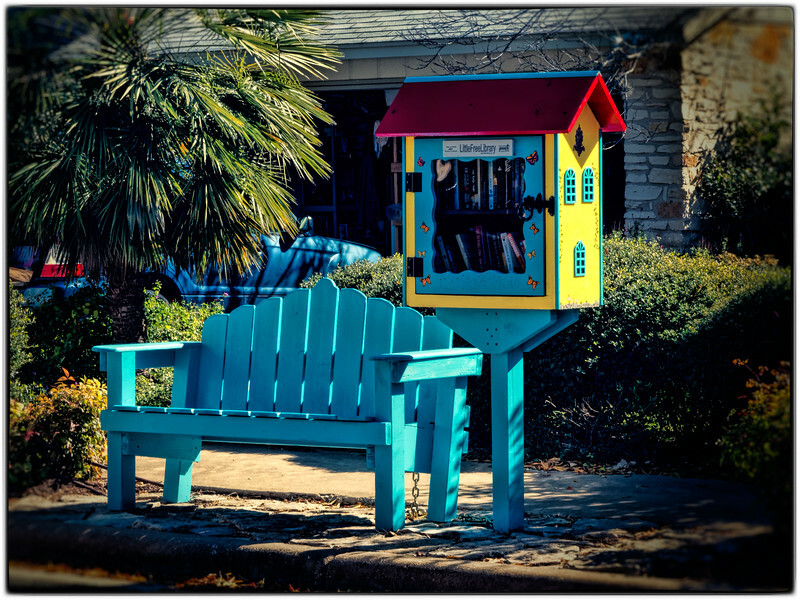 A Little Free Library in front of a home in a southwest Austin, Texas subdivision. Pedestrians can borrow a book or replace it with another book. No deadlines. No late fees. No worries. These free libraries are part of what is now a world-wide movement to promote reading http://littlefreelibrary.org/). Shot with an Olympus E-M1 and M.Zuiko 60mm f/2.8 Macro. Raw conversion in DxO Optics Pro 10 via Lightroom 5.7. Post processing in Photoshop CC 2014, Topaz Adjust 5 (HDR Light Pop Grunge), Topaz Clarity, Alien Skin Exposure 7 and Google Nik Color Efex Pro 4.